The Seoul International Media Art Biennale is looking to make a radical bet on the future, amid a deluge of disasters and crises worldwide that have cast a grim shadow over society. 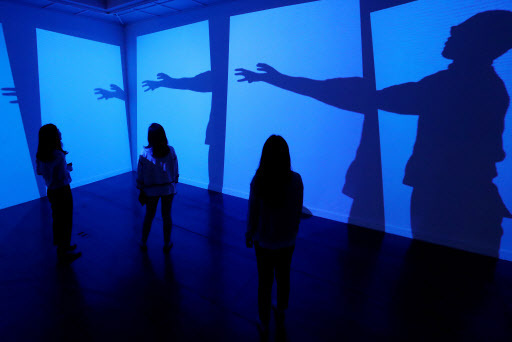 Taking place at the city-run Seoul Museum of Art since 2000, the biennale is the biggest international showcase of media art in Korea. Now in its ninth edition, this year’s event has brought together multimedia works from 61 teams of artists from over 20 countries, including Korea, the Netherlands, Japan, Brazil and South Africa. Titled “Neriri Kiruru Harara,” the 2016 biennale borrowed words from Japanese poet Shuntaro Tanikawa’s “Two Billion Light-Years of Solitude” to explore and come to terms with the uncertainty of tomorrow. Published in 1952, the poem ponders the vastness of the universe and imagines the language shared by Martians. From virtual reality to drones and 3-D printing, the exhibition also emphasizes the role of advanced technology in society. 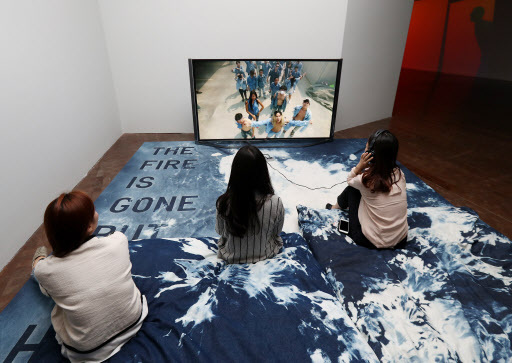 In addition, the biennale -- also referred to as Mediacity Seoul -- has evolved to feature more female and young artists, said Kim Hong-hee, director of SeMA. Female artists make up approximately half of all participants, and the number of young artists in their 20s and 30s has risen by about 30 percent. This year’s SeMA-Hana Media Art award went to co-winners Christine Sun Kim and Korakrit Arunanondchai, who received 50 million won ($44,800). The award is given to those who best embody the theme and spirit of the biennale. Deaf since birth, Korean-American Kim is a New York-based artist who attempts to challenge the notion of sound through installations, drawings and live performances. Arunanondchai, a 30-year-old Bangkok-raised multimedia artist, will present works containing both modern and traditional elements of Thai culture at the exhibition. Taking place at four branches of the Seoul Museum of Art -- Seosomun Main Building, Nam-Seoul Living Arts Museum, Buk-Seoul Museum of Art and Nanji Residency -- the media art biennale will run from Sept. 1 to Nov. 20. Admission is free. For more information, visit mediacityseoul.kr.